Laboratory testing using digitalized GNSS signals recorded in the real world. The testing services based on replay technologies use GNSS signals collected in the real world. These signals are digitized and recorded in the field to be replayed on dedicated test benches. Thus, it becomes possible to reconstruct the experience in laboratory GNSS test conditions, similar to those obtained in the real world. The GNSS frequency bands are scanned with great precision to be able to restore signals with a high fidelity. The DUT (Device Under Test) are also installed inside test benches where GNSS signals are broadcasted. Unlike conventional simulations, thses signals were digitized and recorded during previous test campaigns, in representative real environments, to be replayed in lab. The test areas are selected according to different categories, which are predefined according to expected evaluations. This testing bench is particularly well suited to valid operations and already recommended by the certification bodies. The worst cases of each environment can be recorded and then used to assess the capabilities of DUT to overcome the feared errors. The Receiver filters can be submitted to evaluate RF interferences encountered in the field so that the wrong effects can be measured. In addition, the manufacturers have the opportunity to tune the setups of their receivers by repeating certain critical situations in order to resolve residual errors. 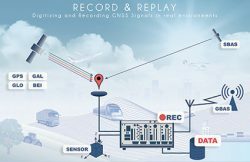 The GNSS community expects to enhance soon the receiver performances thanks to broadcasted correction/augmentation data, such as EGNOS/EDAS, PPP… This replaying instrumentation offers the sole current simulation solution to combine these signals with those from GNSS constellations. 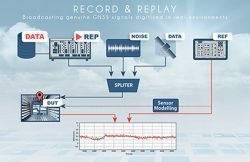 (1) The Replayer generates GNSS real signals previously digitized. Scenarios are then replayed to subject your GNSS-enabled devices to accurate, repeatable tests. 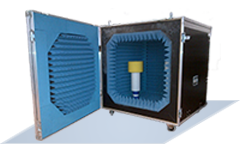 (2) The anechoic chamber’shield preserves the measurements from outside interference and absorbs electromagnetic waves, eliminating parasitic reflections in such a confined environment. (3) The computer system controls operations and collects data from the devices which have undergone testing. The data is then compared with the data initially introduced into the chamber by the simulator.